Ah that great week in Paris! The courage for freedom that wafted through here has, of course, overturned the night-lights so that the red curtains on some thrones have caught fire and the gold crowns have grown hot under the glow of the night-caps. But the old catch poles are already bringing up the dowsing buckets and sniffing about all the more vigilantly. Victor Hugo stayed at home. Busy researching for his novel, The Hunchback of Notre Dame, he did not wish to leave his wife alone, who had given birth to a daughter just four days before. The young Alexandre Dumas, on the other hand — later to achieve world renown for his swashbuckling The Count of Monte Cristo — bravely shouldered a double-barrelled musket, ready to risk his life for freedom with thousands of students, merchants, workers and actors. Paris was once again on the brink of a revolution. 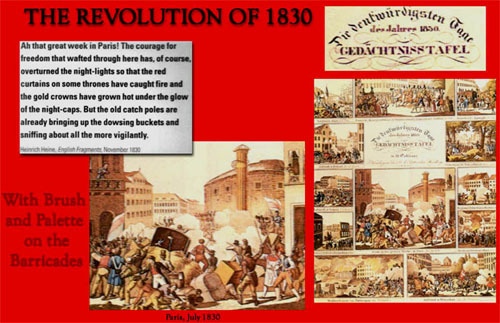 The streets were full of agitated citizens confronting the royal guards with pistols and wooden cudgels, rifles and knives. The cause of the uproar was the citizens' fear that the old system of royal oppression, which had been abolished, was on the rise again. As early as 1814 the royal house of Bourbon had regained its former power. Lotus XVIII, younger brother to Louis XVI, who had been executed during the Revolution, had been summoned from exile to rule France after the fall of Napoleon. Moderate and cautious, he had pursued liberal policies, combining the modern feeling for liberty with the principles of the ancien regime. When Louis XVIII died in 1824, Charles X, the youngest of the three brothers, had himself crowned at Reims with medieval pomp and circumstance. Forward-looking contemporaries found him both reactionary and foolish. Desirous of reviving pre-Revolutionary France, he intended to restore the ancient titles and privileges to the aristocracy as well as one billion francs in reparations for the property lost by the nobility during the Revolution. After Charles X issued a series of repressive decrees on 25 July 1830, abolishing freedom of the press, dissolving the legislature and depriving the majority of citizens of suffrage, things came to a head. 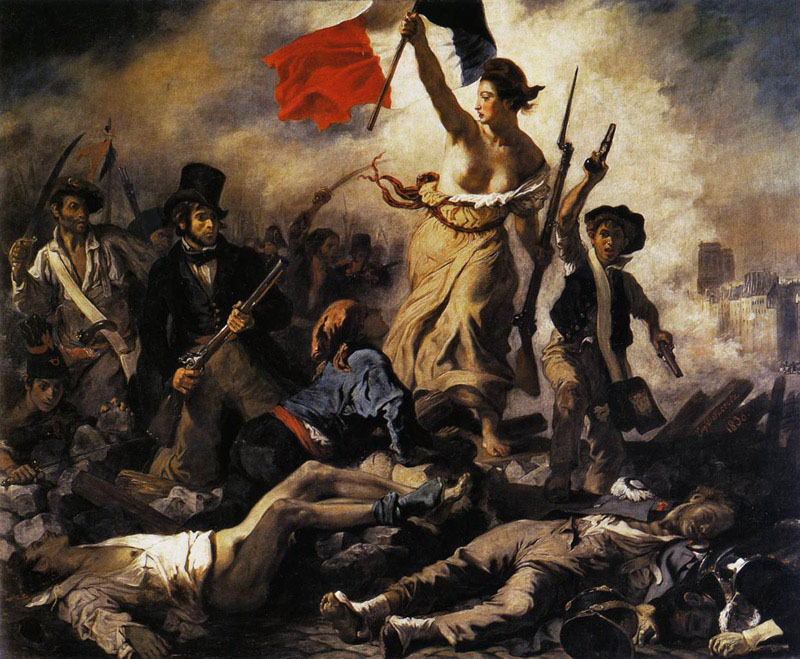 On 28 July 1830 revolt broke out not far from Eugene Delacroix's studio. While mercenaries deployed by Charles X fought their way through the narrow streets, supporters of the revolutionaries hurled furniture, wash-tubs, rooting tiles and tool chests down on them from windows, finally dumping entire cartloads of melons on the heads of the advancing royal troops to stop their progress. The street battles raged for three days. Painter and caricaturist Honore Daumier suffered a sabre-slash across his face during the fighting. On 3 August 1830 the citizens were victorious, forcing Charles X to abdicate and flee into exile. Delacroix, who had observed the revolt at a safe distance, took up his brushes and palette. In a letter to his brother written in October 1830, he confessed: "Although I didn't fight, I'll at least paint for our country!" And the result was Liberty Leading the People, the archetype of the Revolution.